Candidates will partake in a week-long campaign beginning Monday, April 8, once their petitions are approved by the student-run Election Planning and Advisory Committee. In order to be eligible, candidates require a specific number of student signatures depending on position. 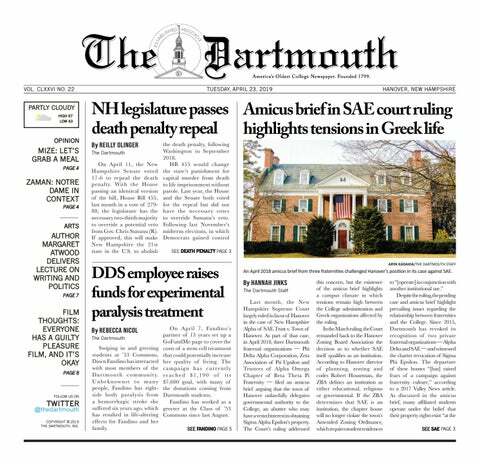 Before the polls open on Monday, April 15, The Dartmouth will host a debate at Dartmouth Hall between the student body presidential and vice presidential candidates. Students will ultimately elect a student body president, student body vice president and class senators to comprise the Student Assembly. Students will also elect a senior class president, senior class vice president and class council executive board members to form the Council of Class officers. Elizabeth Clark ’20, who currently serves as a COCO executive, explained that COCO has not worked closely with Student Assembly in the past, though the potential for cooperation has been discussed. She said that this term, COCO has a $19,000 budget that will be allocated toward “class bonding activities.” In the past, COCO has hosted pizza parties and an Inflatable Day on the Green, as well as provided free gear. Student Assembly’s website states that the organization attempts to “lend a voice to student concerns and opinions; play an active role in shaping College policy; protect student rights and freedoms; promote and finance undergraduate activities; foster school unity and pride; and serve as a forum for the discussion and advancement of ideas.” Over the last year, some the achievements cited by its website include helping to redesign Banner Student, an online portal for various student sites and links; creating a new website for the Student Assembly; hosting town halls and speaking events; increasing the visibility of the Student and Presidential Committee on Sexual Assault on campus; and securing student subscriptions to the New York Times. Following last year’s election, the “lack of institutional memory” and prior “dormancy of student government” proved to be an immediate obstacle, Walters said. She explained that, because of this issue, the Student Assembly had to navigate how to build relationships with various faculty and staff in order to move forward with their planned projects. Knape added that the primary goal this year has been to make the Student Assembly a more inclusive and visible organization. Once they were elected, Knape and Walters created two new executive positions, a secretary and an ambassador of student life, to streamline projects. With the help of a larger leadership team, Knape and Walters constructed a new Student Assembly website, hosted weekly office hours in Baker Lobby and regularly sent out emails to discuss the progress of various projects. Besides these initiatives to increase open communication, Knape explained that she is most proud of their recent work in sponsoring the Resolution for Investigating Acts of Racial Bias. “Our advocacy basically jumpstarted a change in legislation and we have formed a working group composed of administrators, faculty and students that will work to determine a way that students can better report bias and receive support after doing so,” she said. Walters echoed this sentiment, explaining that the Resolution was a challenge because “they were forced to take a less amicable approach” to advocating for change. In addition, Knape said they have worked to address food insecurity on campus. She recently met with dean of faculty Kathryn Lively and executive vice president Rick Mills to discuss the possibility of opening up campus dining halls during interim periods and ways to support students who run out of dining dollars and meal swipes toward the end of the quarter. As discussions about possible food insecurity solutions continue, Walters said that she has been able to set up a voucher system that provides students facing food insecurity with gift cards to the Co-op Food Store that have up to a $25 value. The Student Assembly is also attempting to find ways to subsidize the cost of travel by the Dartmouth Coach, Knape said. Luke Cuomo ’20, a Student Assembly senator who has submitted a petition to be a presidential candidate, noted that part of the reason student government operates differently at Dartmouth than it does on other campuses is because the Student Assembly is not responsible for allocating funding to groups. He said that it did, however, receive a budget of $45,000 last year. Cuomo said that because of this experience, he recognizes that the Student Assembly president has to balance representing the interests of the community and maximizing the budget to provide much-needed services. Tim Holman ’20, another Student Assembly senator who has also submitted a presidential petition, said that although Dartmouth student government continues to have a reputation for not serving a purpose, he has seen gradual progress. However, Holman stressed that not enough has been done to elevate the student body’s voice. However, both Cuomo and Holman said they are looking forward to the announcement of the 2019 election candidates.